Ballasting is both the art and science of adding the right amount of weight to each axle of your tractor to achieve optimal performance. [Read more…] about All About Ballasting! ‘Transport Pressure’ Vs ‘Operating Pressure’: What’s the difference? Tyre manufacturers generally recommend the correct “transport pressure”, which is the term used for the inflation pressure applied for when the machine is travelling on the road. In many cases this pressure is 23PSI — sometimes higher. [Read more…] about ‘Transport Pressure’ Vs ‘Operating Pressure’: What’s the difference? 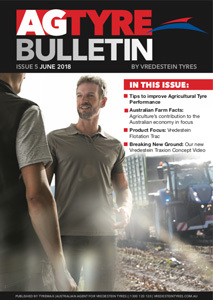 Welcome to Edition 5 of the AGTYRE BULLETIN. 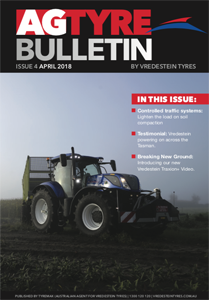 Welcome to Edition 4 of the AGTYRE BULLETIN. 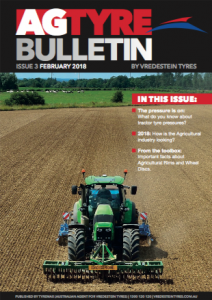 Welcome to Edition 3 of the AGTYRE BULLETIN. The Australian Wine Industry – what’s in store for 2018? Australia is one of the world’s largest wine exporters, with about two-thirds of Australian wine production being exported and major export markets including Canada, China, the European Union, Hong Kong, New Zealand and the United States. [Read more…] about The Australian Wine Industry – what’s in store for 2018? The Australian Cotton Industry – what’s in store for 2018? Australian cotton production is forecast to rise by 4% to 968,000 tonnes in 2017-2018. This rise is despite a reduced area of cotton planted and lower returns being forecast due to falling world prices. [Read more…] about The Australian Cotton Industry – what’s in store for 2018? The Australian Sugar Industry – what’s in store for 2018? According to ABARES, Australian sugar production is forecast to fall by 2 per cent to 4.7 million tonnes in 2017-2018, but exports should remain at a similar level to previous recent volumes. [Read more…] about The Australian Sugar Industry – what’s in store for 2018?